As practitioners of various modalities, be it Pilates, personal training, yoga, dance, movement practices or manual therapies, we are integral to the development of our clients' well being. This foundation begins with walking and balance. Come tackle sophisticated gait mechanics, assessments, and proper pattern implementation. Sharpen your eye and investigative skills through the use of equipment, props, and technology. Transform your understanding of walking by getting back to basics. Learn how to integrate these innovative approaches into your own practice. Spend a whole weekend nourishing yourSelf in a beautiful setting in upstate New York. Eat wholesome nutritious food, learn healthy cooking methods and different ways to feed your body and soul, take a variety of movement, meditation and self-treatment workshops, participate in led discussions on various topics of health and vitality, and enjoy the magic of both a labyrinth and a fireside ritual. Roam among acres of beautiful land or take time for yourself to read, journal, rest or even get a private treatment or guidance. Meet other like-minded women, indulge your senses and fill your well for the Autumnal Equinox. 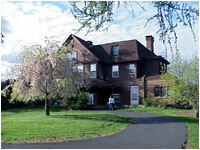 For a photo tour of the Phoenix House, the grounds and information about the Grail organization, visit www.grailatcornwall.com. All rooms are outfitted with 2, 3 or 4 beds. Linens and bath towels are provided. Karen’s Retreat Classes: Karen will lead a MELT Method Foot Treatment, which helps reduce pain and tension in the feet and low back, create buoyancy by opening joint space, calm the nervous system and help one feel grounded. A Fluid Core Class of gentle explorations to nourish and rehydrate the psoas, our deepest core muscle, to improve alignment, reduce pain and address possible emotional components of pain. And, an Essential Oils workshop with Young Living Oils including how and why they work and how to use them for physical or emotional imbalances or even clean your house. Renee Orona has 20 years of experience in the field of dance, biomechanics, and movement education. She has a B.F.A. in Dance and certifications in Pilates, Gyrotonic, Gyrokinesis, and the Trager Approach. Prior to founding Kinetic Body Labs, Renee was an instructor at Soma Syntax Studio, ShapeShift Studios and BUS in Los Angeles. In New York City, she taught at Power Pilates and was a master trainer at the Kane School of Core Integration, teaching students Pilates vocabulary, basic joint mechanics, and touch cues. Renee continually updates and integrates her education by studying with the best movement-based educators in the field. Currently Renee is accepting new clients, developing home programs for self-care, and teaching educational workshops. Kinetic Body Lab is passionately committed to helping you improve your everyday life, maintaining the spirit of play, and using the latest knowledge to facilitate technical precision. Renee’s Retreat Class: Ease and strength. This is a blend of Trager and Pilates, making use of their tried and true concepts. Trager encourages optimal ease and pleasure; Pilates has you circuiting through your whole body, using exercises to challenge your strength and agility. Giuliana Ciampoli has been working in the fashion industry for over 20 years, and enjoying herself in the kitchen for at least 30 years. After feeling sick for about 2 years straight, but having what people would call a “sensitive stomach” seemingly all her life, she got tired of feeling bad and went to a string of doctors. After ruling out many more alarming illnesses, Giuliana went to a nutritionist and learned that she has an acute gluten sensitivity. Since then, she has been endeavoring to create gluten-free foods that do not taste like a compromise while nourishing her body, brain, and soul. She and a partner are in the process of opening an all-gluten free store and cafe in Brooklyn. Giuliana’s Retreat Class: Saturday night cooking class/dinner: Deliciously Gluten-Free. Giuliana will be discussing what gluten is, what it does for food and the basics of gluten free cooking, including which grains and flours are – and are not- gluten free, and, very importantly, how to use them for appropriate flavor in savory and sweet items. She will also discuss celiac disease and gluten sensitivity in general, as well as aspects of the Paleo diet. We’ll kickoff the first meal of our retreat with some Ayurveda wisdom and cooking! Just as all things in Nature are in harmony, the body, mind, senses, and spirit exist together as one unit – a whole unit. As you align with Nature’s rhythms according to your unique mind-body energies, living a healthy and happy life can truly be easy! This is the essence of Ayurveda, ancient India’s Self-healing, vast wisdom. This Ayu focus is on food, one of the building blocks of our body temples. Food is one of the direct ways in which the Universe transmits energy and vibrations to us, reprogramming and rejuvenating your cells and tissues for lasting energy. In this session, you will learn why you are not what you eat but what you digest and eliminate!, learn and use kitchen spices as medicine, get hands-on experience making a cleansing tea and a detox meal, and simple, practical tips for Abundant Energy. KJ’s Retreat Class: Nia, which is a movement technique that, while advanced in design, is suitable for all levels of fitness. It artfully blends dance, martial arts and healing practices into a soulful experience and energetic workout. Classes are taught barefoot to music of many genres. Nia invites you to sense and discover your body’s way, through strength, grace and creative expression. Amy Bakerhas been in private practice as a NYS licensed massage therapist since 1998. She has also incorporated Polarity Therapy and Craniosacral Therapy (CST) for Pediatrics & Adults, as well as prenatal, sports and other massage techniques and Young Living essential oils. Committed to empowering and educating clients in awareness and self care, Amy initiates dialogue not only with a client’s body, but also with the innate wisdom present therein. This allows for a client to walk away from a session with tools to employ themselves when addressing issues surfacing in their physical bodies, and even in their lives. For her work with babies, children & pregnant mothers, Amy brings over 10 years of practice in CST for Pediatrics and prenatal massage. As well as her experience as a mother of two. Amy’s Retreat Class: Meditation discussion and session on using meditation & relaxation techniques to facilitate awareness of self. Have something you want to address and care for personally? Spots are very limited and on a first-come, first-served basis. Therefore, it is requested that private treatments and instruction are booked prior to the retreat, but payment for such services is separate and paid directly to practitioner after session. *After registering for the retreat you’ll receive an email with a full description of all treatment and instruction options and prices along with a link to sign up. If you are driving and have room to take others, or, if you are looking for a ride, please email.